In order to obtain a data basis for this five-step proposal IFFM and SFMP jointly conducted on request of the MoFEC a study using ERS-2 SAR (European Radar Satellite 2, Synthetic Aperture Radar sensor) spaceborne radar images to disclose the size of the fire affected area for the entire province according to all land uses. Fire damage was assessed by discriminating three damage classes which are explained in the footnote of Table 1 (Hoffmann et al. 1999a, Siegert and Hoffmann 1999, Siegert and Rücker 1999a,b). The Directorate of Forest Inventory and Land-use Planning (INTAG) and the two MoFEC- GTZ projects further agreed to develop a revised forest land-use map, exposing the actual locations and boundaries of the current forest and industrial crop utilization right holders, in East Kalimantan. The overlay of the radar survey results with the actual forest land use boundaries revealed the fire damages for each land-use type. Furthermore the data is intended to support the provincial agencies to revise the current land-use plan of East Kalimantan. It shall be used as basis for the implementation of appropriate salvage felling activities, rehabilitation measures and adjustments of the long-term forest planning in each natural forest concession. Moreover, the data will be used within the IFFM Fire Information System to point out future fire hazard and fire risk zones in East Kalimantan and hence support fire management planning, prevention work and fire suppression (Hoffmann et al. 1999b). The results of the ERS-SAR radar inventory show that the 1997/98 fires affected a total of 5.2 million ha – corresponding to ca. 25% of the total land area of the province. Almost 2.3 million ha are located in natural forest concession areas (56 HPH and Ex-HPHs), 0.4 million ha in protected forests, and 0.9 million ha 30 HTI forest plantation enterprises (HTI: Hutan Tanaman Industri) and 0.7 million ha industrial crop plantations were affected. Almost 75% of the plantation areas (forest, oil palm, etc. ), that were located within the 1997/98 fire zone, have been fire affected, a large number of them severely. This demonstrates the very high fire risk of types of all plantations. Table 1 shows an overview of the fire damage related to the current land-use system. Fig.1. Fire damage classification of the 1997-98 fires in East Kalimantan, Indonesia, based on ERS-SAR images. Tab.1. Overview of area burned in East Kalimantan, Indonesia, in 1997-98 related to land-use classes and damage levels (see footnote). * The damage classes 3 and 4 represent two different conditions of severely damaged forests. 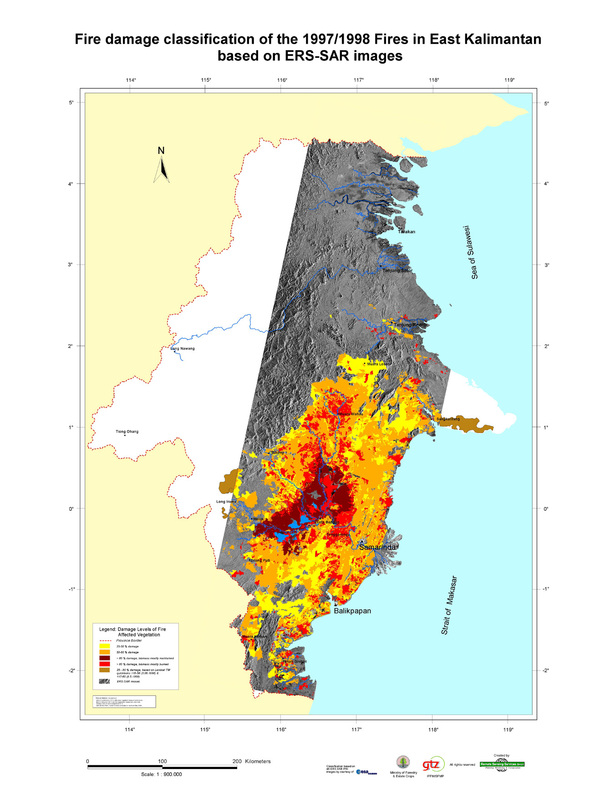 Damage class 3 represents the conditions prevailing in the (peat-) swamp forests of the Middle Mahakam lake area where almost the entire area was affected by fire. The dead trees are still standing. This condition provides a high future fire risk given the high fuel loads remaining after the fires. Damage level 4 includes forest plantations, degraded forest, bush and grassland as well as farmland. The recent loss to forest economy is immense, considering short and long term economic losses to the natural forest alone. In 1982/83 a severe fire catastrophe had already occurred in East Kalimantan, damaging 3.5 million ha of land and forest. Out of this 0.8 million ha was primary forest and 1.4 million ha was logged-over forest (Lennertz and Panzer 1983). In 1997/98 the area of the 1982/83 fire burned again to an even greater extent, particularly towards the west, north-west and south west. The long term effects due to repeated damage, the loss of natural regeneration and the need for large scale rehabilitation under the high risk of future fires by far outnumber the short term losses. Without financial support many areas will not be successfully rehabilitated. Active rehabilitation of natural forest concession areas is mainly needed in areas with a fire damage greater than 50%. It can be expected that most of the former well stocked areas with a 25-50% fire damage will recover naturally, especially if further damage through logging does not occur. This still leaves a rehabilitation area of almost 1.6 million ha in the natural forest concessions alone. Funding and investment security are the largest obstacles to be overcome before effectively starting forest rehabilitation. After the 1997/98 fires the forest is much more susceptible to fire due to degradation and accumulation of fuel and thus now even during normal dry seasons it will be prone to fires. Furthermore, El Niño events are predicted to occur more frequently than in the past, creating conditions that could trigger even more fires in the future. Land use conflicts between the local people and concession and plantation owners, carelessness and land clearing using fire can under these conditions easily bring forest activities to an end. Already many degraded and undefined land use areas are prone to Imperata cylindrica (alang-alang) grassland cycles, where fire becomes a part of the succession cycle. Therefore fire management is a key issue in achieving the goal of sustainable forest management. Hoffmann A. A., A.Hinrichs, and F.Siegert. 1999a. Fire damage in East Kalimantan in 1997/98 related to land use and vegetation classes: Satellite radar inventory results and proposals for further actions. With contributions from G.Ruecker, L.Christy, and B.Yuliarso. Sustainable Forest Management Project (SFMP) & Integrated Forest Fire Management (IFFM) Project, Indonesian Ministry of Forests and Estate Crops (MoFEC) and German Technical Cooperation Agency (GTZ), Samarinda, Indonesia. Report No.1. Hoffmann, A. A., L.Schindler, and J.G.Goldammer. 1999b. Aspects of a Fire Information System for East Kalimantan, Indonesia. Proceedings of the 3rd International Symposium on Asian Tropical Forest Management, Samarinda, East Kalimantan, Indonesia, 20-23 September 1999. Goldammer, J.G., B.Seibert, and W.Schindele. 1996. Fire in dipterocarp forests. In: Dipterocarp forest ecosystems: Towards sustainable management (A.Schulte and D.Schöne, eds. ), 155-185. World Scientific Publ., Singapore-New Jersey-London-Hongkong, 666 pp. Goldammer, J.G. 1999. Environmental problems arising from land use, climate variability, fire and smog in Indonesia: Development of policies and strategies for land use and fire management. In: WMO Workshop on Regional Transboundary Smoke and Haze in Southeast Asia, Singapore, 2-5 June 1998, Vol. 2 (G.R.Carmichael, comp. ), 13-88. World Meteorological Organization, Global Atmosphere Watch Report Ser. No. 131, WMO TD No. 948, Geneva, 346 p.
Lennertz, R., and K.F.Panzer. 1983. Preliminary assessment of the drought and forest damage in Kalimantan Timur. GTZ-TAD Report, Germany. Siegert, F., and A.A.Hoffmann. 1999. The 1998 forest fires in East Kalimantan (Indonesia): A quantitative evaluation using high resolution, multitemporal ERS-2 SAR Images and NOAA-AVHRR Hot Spot data. Remote Sensing of the Environment (in press). Siegert, F., and G.Ruecker. 1999a. Evaluation of the 1998 forest fires in East-Kalimantan (Indonesia) using multitemporal ERS-2 SAR images. Earth Observation Quarterly 61, 7-12. Siegert, F., and G.Ruecker. 1999b. Use of multitemporal ERS-2 SAR images for identification of burn scars in South East Asian tropical rainforest. Int. J. Remote Sensing (in press).